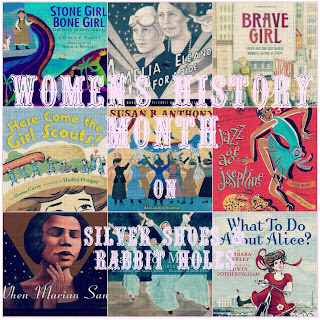 A few more books we've read for Women's History Month! I must say, the girls and I have had a wonderful time delving into nonfiction, reading about such strong, important, fascinating women of the last few hundred years. Today's post spotlights some picture books about president's wives, a president's daughter, some suffragist heroines, and a pioneer aviatrix! by Shana Corey, illustrated by Chelsey McLaren. Subject: Amelia Bloomer, temperance and suffrage activist, editor of The Lily (a newspaper for women). What We Learned: Amelia Bloomer thought the restrictive corsets and wide, heavy skirts women wore were silly. When Elizabeth Cady Stanton brought her cousin Libby for a visit, Amelia was immediately taken with Libby's style of dress. Libby had just returned from Europe, where she had adopted a European manner of dress for her travels. Her skirt was short, and underneath, she wore a type of pants! Amelia made her own outfit and began to wear it in public, much to the shock of those around her. She championed the new style in her newspaper, and other suffragists and temperance workers began to wear the style, too. The naysayers began calling the new pants "bloomers," and used the term to derogatorily describe the workers in the women's rights movement as well. Eventually, the style faded, as the women wanted people to focus on more important issues. But as we see at the end, bloomers were just the beginning of liberated clothing for women. 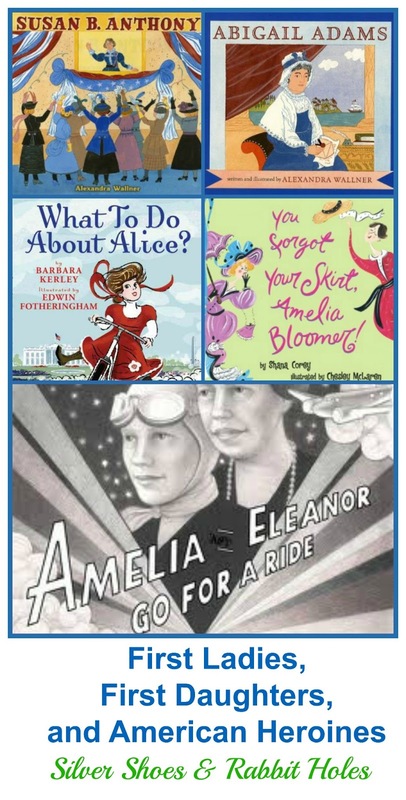 Why We Like It: Shana Corey also wrote Here Come the Girl Scouts!, among many other fabulous biographical picture books. I love how accessible these books are for my daughters. The language is simple, the text is rather short, yet you learn so much! Chelsey McLaren's illustrations are wonderful, too, reminiscent of fashion sketches. Subject: Susan B. Anthony, who worked tirelessly for women's suffrage in the United States during the 19th century. Sadly, she died fourteen years before the ratification of the 19th amendment, but the amendment was often referred to as the "Susan B. Anthony amendment" in her honor. What We Learned: Susan B. Anthony was lucky enough to have been born into a family that believed both boys and girls should be educated. When the teacher at Susan's school refused to teach her math, believing only boys should learn math, her father started his own school for his mill workers' children, where both boys and girls could learn the same subjects. When she was 18, she became a teacher, choosing to remain independent. She eventually left her teaching job, choosing to focus her life's work on educating the American public about the rights of women, and the evils of slavery and alcohol. She met and became friends with Elizabeth Cady Stanton, who had organized the first women's rights convention. They both adopted the "bloomer dress" [see above! ], but put it aside because people were too focused on their appearances to listen to what they had to say. After the emancipation of slaves following the Civil War, Susan started a magazine pushing for the rights of women and freed slaves to vote. When the 15th amendment passed, allowing African-American men to vote, she turned all her attention to women's suffrage. She managed to convince 50 other women to register and vote with her, claiming the 14th amendment allowed "all persons born or naturalized in the U.S." to vote, not just men. She was arrested and forced to stand trial. Although she was found guilty, she never paid the fine. She and Stanton began to record their battles for a future generation, beginning to see that perhaps their cause would fail to be won in their own lifetimes. Susan died in 1906. Women were granted the right to vote in 1920. Subject: Abigail Adams, wife and First Lady of John Adams, second President of the United States. 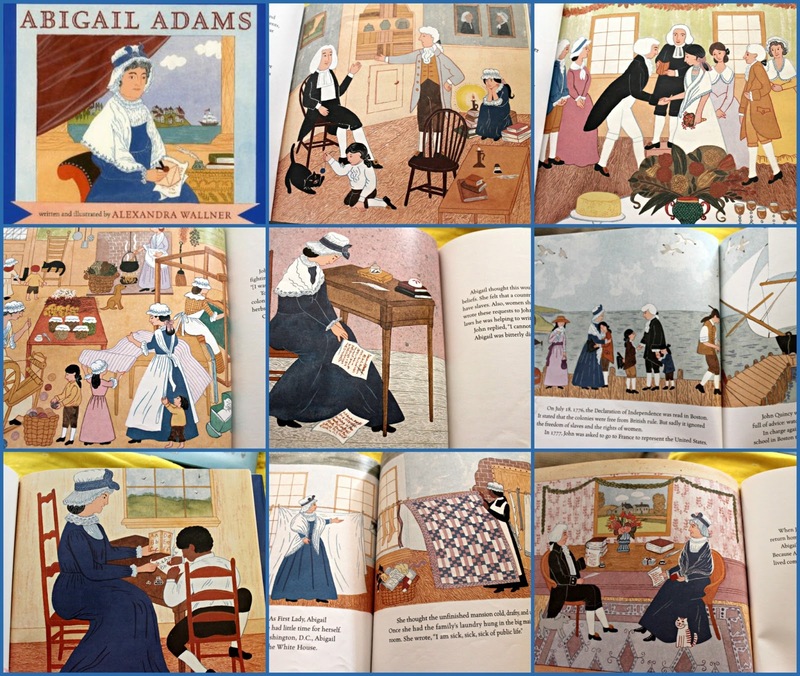 What We Learned: Abigail Adams was born near Boston in 1744. As a girl, she was desperate to attend school, but only her brother was allowed to go. She educated herself using her father's library. As a teenager, she began writing letters to keep in touch with some new friends. Letter-writing became very important to her, and thousands of her letters still survive today. She met a young lawyer, John Adams, when she was 17. They married three years later. They loved each other, and Abigail felt that John respected her opinions. The Adamses had a large family, and Abigail worked hard to raise her children, while also paying attention to and helping with the new cause of American liberation from England. John was elected to the Massachusetts legislature, while Abigail and other colonial women found ways to avoid using British goods, such as making "liberty tea" from herbs. While John was away during the early days of the Revolutionary War, Abigail gave food and shelter to people fleeing Boston for the countryside. She witnessed the Battle of Bunker Hill and wrote to John about it. He showed her letters to the leaders in the war effort, so that they could understand the suffering. She also wrote to John about her feelings on slavery and the rights of women, hoping John would urge his fellow lawmakers into action. John's dismissive response was a bitter disappointment to her. The Declaration of Independence was read in Boston in 1776, but only spoke of the rights of white men. The book covers John's career as ambassador to France and England, and how Abigail aided his efforts by giving wonderful dinner parties and talking politics with guests. John became the first vice-president of the United States under George Washington. While Abigail joined him in the capitol (Philadelphia at that time) occasionally, she was often sick and stayed behind on their farm, Peacefield, while doing lovely things like teaching a black servant boy to read when he was not allowed to attend school. When John became president, Abigail became the first First Lady to live in the newly constructed White House in Washington, D.C. She didn't like the White House, and was quite happy to return home upon John's failure to be reelected. Abigail had managed the family funds so well, they were able to retire comfortably. 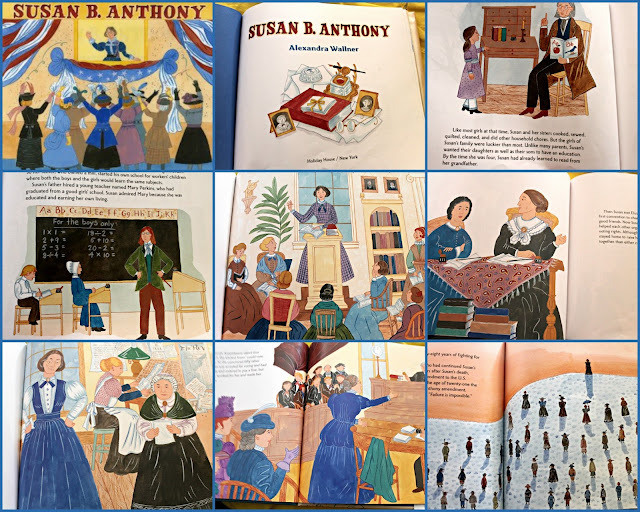 Why We Liked It: Like Wallner's biography of Susan B. Anthony above, Abigail Adams is straightforward biography, with folk art illustrations. by Barbara Kerley, illustrated by Edwin Fotheringham. Subject: Alice Roosevelt, irrepressible daughter of Theodore Roosevelt, 26th President of the United States. What We Learned: Alice was Teddy Roosevelt's oldest child, his daughter with his first wife, Alice, who died two days after young Alice was born. 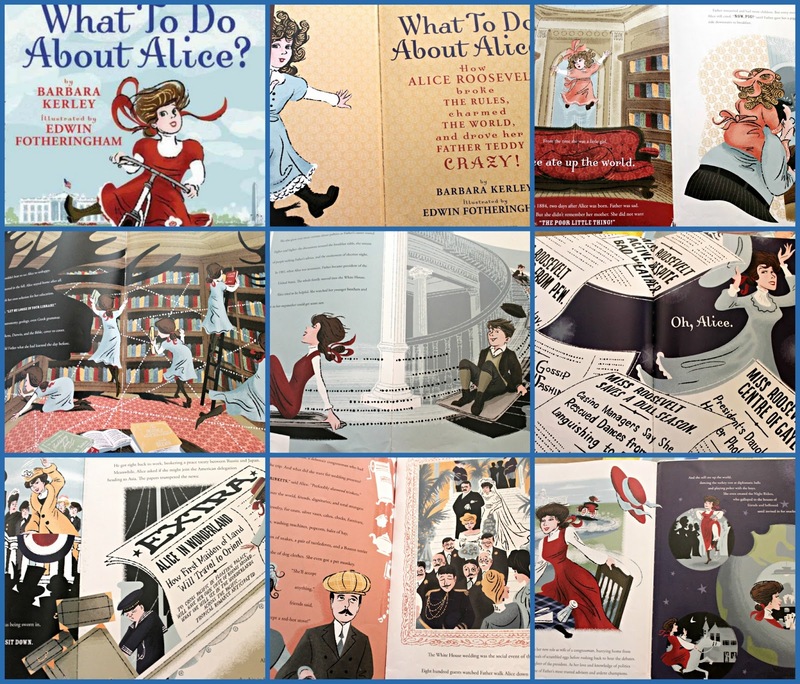 We learn that Alice was a precocious, rambunctious child, even when forced to wear leg braces for a time. She was a tomboy. She was thrilled to not have to attend school, and educated herself via her father's library. When her father became president when Alice was 17, she threw herself into the role of "goodwill ambassador," opening the Buffalo Exposition and making trips to Cuba and Puerto Rico, for which her father praised her. She became a real celebrity, with dresses, gloves, and a color named for her, songs written about her. During Teddy's second term as president, she convinced him to let her be part of the delegation to Asia, where she had a grand time, returning with crates and crates of "loot" (gifts). She married congressman Nicholas Longworth, whom she met on the trip. She immersed herself in politics, a trusted adviser to both her father and husband, and continued to live her freewheeling, unconventional life. She preferred sitting in Congress to calling on her fellow Washingtonions. In the author's note, we learned she stayed in Washington long after her husband's death, throwing dinner parties and championing her favorite causes. She was referred to as "the other Washington Monument." Why We Like It: Well, first of all, look at those illustrations! Edwin Fotheringham did a beautiful job on this book. 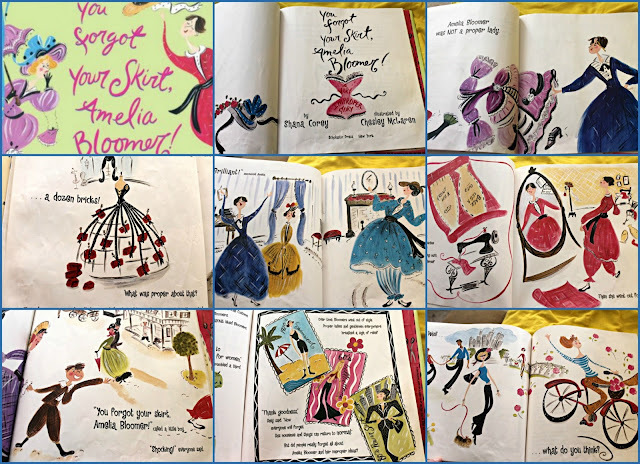 Alice was a colorful figure and deserved a colorful book such as this. I didn't know much about her before we read this, and the girls and I enjoyed reading about her. I plan to read up on her a bit more myself. 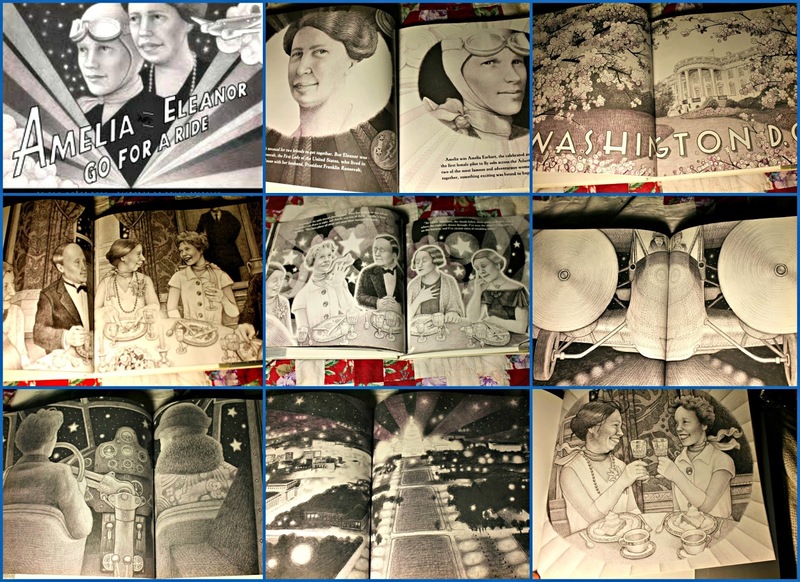 by Pam Muñoz Ryan, illustrated by Brian Selznick. Subjects: Eleanor Roosevelt, all-around awesome person and First Lady to Franklin Delano Roosevelt, 32nd President of the United States, and Amelia Earhart, famous pilot and the first woman to fly solo across the Atlantic Ocean. What We Learned: This book is about one evening in both women's lives. Only a couple months after moving into the White House, Eleanor hosted a dinner attended by Amelia and Amelia's husband, G.P. (The President was at a meeting and not present.) The conversation turned to flying. Eleanor had just received her own student pilot's license at her friend Amelia's encouragement, and Amelia even offered to teach her to fly herself! Amelia described how amazing it was to fly at night, and how beautiful Washington, D.C. was from the night sky. Quite spontaneously, the women decided to fly to Baltimore and back that very night! The book depicts the two women, alone in the cockpit, then imagines them returning to the White House with the reporters and hopping into Eleanor's car for a quick joy ride. We find out in the Author's Note that the women had not been alone in the plane, and that a pilot from the airline had had control of the plane most of the flight, although both Amelia and Eleanor had each had a turn at the controls! There's no proof of the late night car ride, but Eleanor really did prefer to drive herself around D.C. when she needed to be somewhere. We also learn in the Author's Note that Amelia's husband, George P. Putnam, found Eleanor's student pilot license among Amelia's possessions a year after her disappearance in 1937. He wrote to Eleanor, returning the license as a memento. My Favorite Part: Besides the recipe for Eleanor Roosevelt's Pink Clouds on Angel Food Cake? The real life photograph from that night at the back of the book. Such a great collection of books. The illustrations you've shared look wonderful. I must admit that I do not know much about these women, so thank you for sharing it. I'd love to link up! As you can see, I have a lot of nonfiction posts going on for Women's History Month right now. Would you prefer this post, or the one I did today? The list from today is probably a bit more varied.